Longtime KDKA-AM, Pittsburgh Talk Host Mike Pintek Dead at 65. Talk radio host Mike Pintek took leave of his radio talk show on Entercom’s KDKA-AM, Pittsburgh in late June after his treatment for cancer was interrupted by a stroke he suffered. He would not return to the air and the station reports that Pintek died early today (9/12). Pintek, who served with the legendary Pittsburgh news/talk station for more than 30 years, announced back in May of 2017 that he’d been diagnosed with inoperable pancreatic cancer. KDKA-AM reports that after receiving the diagnosis, Pintek began “an aggressive form of chemotherapy and radiation treatments and participated in experimental drug studies to ward off the illness, all while continuing to entertain his thousands of listeners daily on KDKA Radio.” Pintek Joined KDKA-AM in 1982 as a reporter and in 1985 shifted to the role of talk host. During his career he also served with KDKA-TV as a news break anchor and as host of “Pittsburgh 2-Day.” See KDKA-AM’s obit here. Report: Nielsen Exploring Sale of Entire Company. According to a report by Reuters, Nielsen Holdings Plc is working with JPMorgan Chase & Co and Guggenheim Securities LLC, “as well as law firm Wachtell, Lipton, Rosen & Katz, on an ‘expanded’ review of strategic alternatives.” Previously, the company said it was looking at selling its “Buy” segment, but pressure from hedge fund Elliott Management Corp. has it now exploring a sale of the entire company. (The “Buy” segment provides data on consumer behavior and the “Watch” segment is the TV, radio, and digital ratings side of the company.) Not unlike some radio companies, Nielsen is dogged by a 2006 leveraged buyout by six PE firms and its debt is tagged at $8.66 billion while its market capitalization is estimated to be around $9.4 billion. BFoA Prepares for Emergency Grants Due to Hurricane Florence. With the approach of Hurricane Florence, the Broadcasters Foundation of America says it is preparing for an influx of emergency grant applications. It reminds broadcasters whose personal lives or property are acutely affected by Hurricane Florence that they are encouraged to find out if they quality for an emergency grant by visiting https://broadcastersfoundation.org/hurricaneflorence/. The Broadcasters Foundation Emergency Grant Relief Program provides an expedited application process that is streamlined to deliver emergency funds as quickly as possible to qualifying individuals who work (or have worked) in broadcasting. Emergency grants are based on financial need. This year, the Broadcasters Foundation board of directors elected to double the maximum amount of an individual emergency grant from $1,000 to $2,000. This increase is particularly significant when considering that last year more than $300,000 was awarded to individual victims of a rash of disasters that included Hurricanes Harvey, Irma, and Maria, as well as wildfires and floods. ‘Think! America with Terry Gilberg’ Is Added to KBNP, Portland and KTAR, Phoenix. The nationally syndicated Radio America show “Think! America with Terry Gilberg” continues to show healthy growth across the nation with two important Western states clearances – KTAR, Phoenix and KBNP, Portland. The Saturday evening show (8:00 pm – 10:00 pm ET) is produced and hosted by journalist-turned-commentator Terry Gilberg with regular on-air appearances by attorney Megan Porth. Gilberg has been a longtime news reporter and talk show host on a number of Southwest platforms including KFYI, Phoenix. 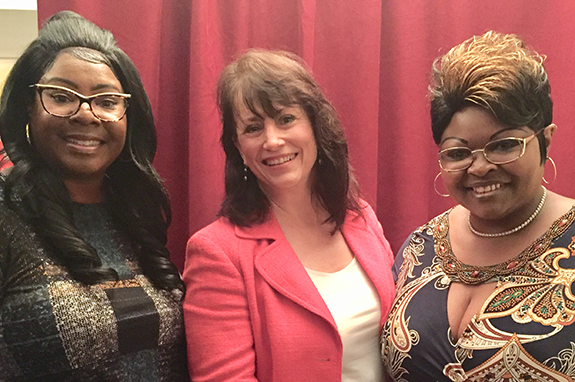 She is pictured above (center) with conservative social media star pundits Diamond & Silk at last week’s “Hold Their Feet to the Fire” radio row in Washington, DC. Hurricane Florence Approaches, Trump-Russia Investigation, Midterm Elections, 9/11 Anniversary, Positive Economic News, Bob Woodward Book, Russia-China War Games, Serena Williams Cartoon Backlash, NFL Action, and MLB Playoff Push Among Top News/Talk Stories Yesterday (9/11). The preparation for Hurricane Florence as it approaches the Carolinas; the Robert Mueller-led investigation into possible connections between Trump campaign operatives and Russian agents; the midterm elections and the battle to control congress; the anniversary of the September 11, 2001 terror attacks; the positive U.S. economic data; Bob Woodward’s new book, Fear: Trump in the White House; Russia and China take part in joint war games; the backlash over the racist depiction of Serena Williams in a Melbourne newspaper; the first week of the NFL season; and the Major League Baseball playoff push were some of the most-talked-about stories on news/talk radio yesterday, according to ongoing research from TALKERS magazine.